Centipedes vary in size from as small as 5 millimeters up to as long as 160. Their bodies are flat and segmented, with a pair of legs for each segment. Coloring varies based on individual species, but the most common colorings for centipedes are shades of brown, bronze, and orange. Centipedes have small mouths that contain large, claw-like structures. These claws contain a venom gland. Contrary to popular belief, not all centipedes have exactly one hundred legs. In reality, they can have anywhere between 15 to almost 200 pairs of legs. Typically, centipedes have one pair of legs per body segment. The more body segments they have, the more legs they have. Centipedes are more nuisance pest than imminent danger. They don’t pose significant danger, but they can use the venom on prey. If handled roughly, centipedes can bite. The bite won’t seriously injure you, but it can hurt pretty bad, break the skin, and cause swelling. Centipedes are frequently the sort of pest that shows up after another pest (such as spiders, flies, and mosquitos) has already infiltrated your home. This combined with access to reliable moisture (such as a leaky pipe or basement mildew) are the two biggest reasons a homeowner tends to face centipede infestations. How can I prevent centipedes? 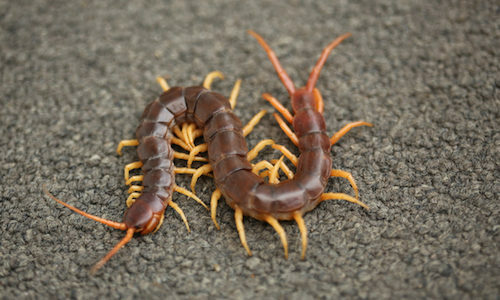 Centipedes are nocturnal and carnivorous, meaning they eat other pests to survive. Stay on top of other pest infestations by addressing them immediately. Make sure there aren’t breaches in the perimeter of your home for pests to enter in through will be your best guard against centipede infestation. Reduce areas of moisture in and around your home by addressing any leaky faucets or pipes as soon as you find them. Remove common sources of outdoor moisture that draw them in such as wood piles, leaf piles, and grass clipping mounds. How can Gregory Pest remove centipedes from my home or business? An expert exterminator from Gregory Pest Solutions will be your full-service pest solutions provider specializing in the effective, humane removal and prevention of centipedes and their nests from your home or business. When you hire us to evaluate how extensive your home’s pest problem is, one of our pros will be sent to assess the situation and then formulate an environmentally friendly plan for removal and prevention. We’ll make sure you and your family can enjoy a lasting insect-free environment.